With 2v2 play, Infinity Stones, and some less-than-pleasant character models, how does the latest chapter of Marvel vs. Capcom hold up? Our review. It's been years since Marvel and Capcom have crossed their universes over, but it's been even longer since their rivalry has been settled in 2v2 tag team battles. The past couple of iterations of the franchise have seen teams of three go at it, but Marvel vs. Capcom: Infinite feels like something of a throwback. 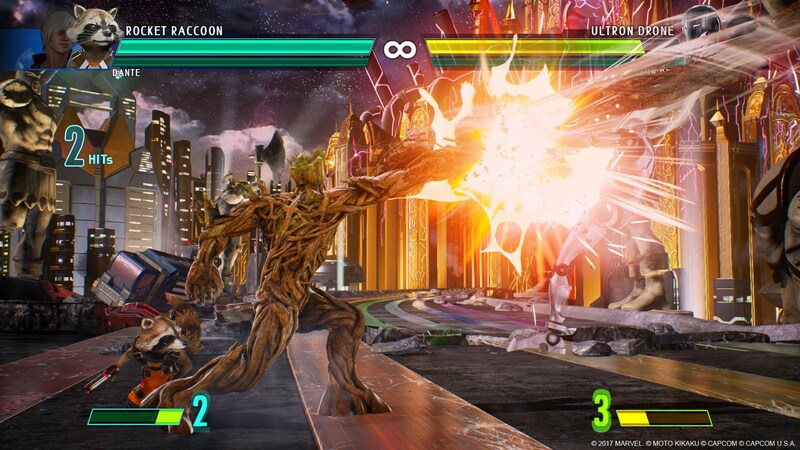 But while Marvel vs. Capcom: Infinite has the potential to be an uncomfortable throwback, Capcom does a good job in providing valuable tools for newcomers, while also giving seasoned veterans plenty to play around with. It's an enjoyable fighting game, even if the presentation leaves something to be desired. The first thing to note is that it's difficult to get over an initial sense of disappointment, regarding Infinite's character count. Going from the 48 characters of Ultimate Marvel vs. Capcom 3 to the 30 playable characters of Infinite undeniably feels like a step back. But out of the characters that are made available, it's a good mixture of new faces with familiar ones from UMvC3. 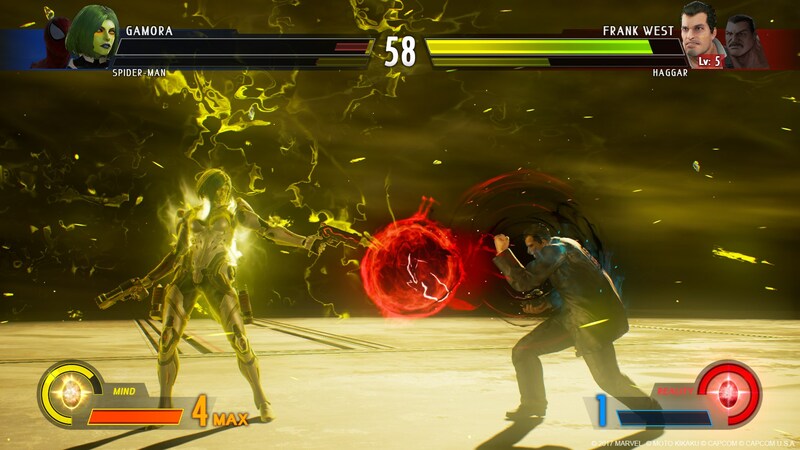 On top of that, the returning characters feel freshly balanced, with Zero and Morrigan no longer feeling crazy overpowered, while lower-tier characters like Nemesis T-Type feel like they have enough new tools that they have a fresh lease on life. Once a match begins, Infinite starts to feel newbie-friendly almost immediately. Expanding on the crossover series' old "Easy" Hyper Combo system, this game also offers up easy auto combos and auto jumping for easier air combos. Combined with the intuitive Mission Mode tutorials, it feels easy to learn the game's systems and start to feel like an expert. And if that sounds like scrubs can get on a more even playing field with experts and pros, that isn't entirely the case. Fighting game veterans will still have a greater grasp of the fundamentals and can easily dispatch online warriors utilizing the newbie-friendly assists. This has been evidenced online, as I found myself getting slammed by multiple pros and far better fighting game players than myself. Those looking to face off at home without the aid of these assists can do so by shutting them off, putting the game on a more even playing field. The other major new aspect of Infinite is the introduction of Marvel's six Infinity Stones. The fully-charged Infinity Surge feels like a more interactive take on the old X-Factor mechanic, with each stone offering a different way to either come back from behind or cinch a victory. The Mind Stone, for example, found its way into my regular rotation for its ability to recharge my Hyper Combo gauge quickly. However, different players I've encountered have found creative ways to utilize each of the stones, leading to some interestingly fun matchups. It makes it that much more of a shame that 3v3 has been dropped in favor of 2v2 matchups, but I'm still experiencing the crazy combos and teamwork-based attacks that have made the Marvel series such a blast to this point. Infinity Stones have definitely added some fun twists to the classic formula. I wish I could say the fun extended into what looked to be a promising Story Mode, but Infinite's offering felt bland, especially as the narrative went on. The story sees Avengers villain Ultron and Mega Man X antagonist Sigma bond over their mutual desire to end all biological life. They pick up the Reality and Space Stones and use them to fuse together the Marvel and Capcom universes, creating a world where the worlds' heroes (and a few villains) are the only organic life remaining. The setup offers potential for some interesting story setups or twists, but Infinite's Story Mode is purely by-the-numbers, with few of the fights offering any kind of interesting variety. Many of them will see teams fighting off multiple drones or corrupted Asgardians, which starts to wear thin after a while. The final boss is at least a more interesting encounter, but by then, the story will have worn out its welcome. It's made worse by some terrible dialogue and awkward delivery. Many of the voice actors try their best, but Ultron nails it with the story's opening minutes. It's mostly banal cliches, mixed in with dull banter and humor that mostly misses its mark. The frequent loading doesn't help, either. Things don't get much better in Arcade Mode, which feels more phoned in here than ever. Granted, it's hard to freshen up a straight-up single-player Arcade Mode experience, but this is literally just a short series of fights, followed by a boss battle, and a simple "Congratulations." There aren't even character-specific endings. It's a massive disappointment compared to Infinite's contemporaries and even compared to most of its predecessors. The single-player presentation just feels boring. Infinite's visuals have improved over what they were at events like E3 and Evo. It's true that they aren't what they were, but what's there now is still somewhat unpleasant to look at. Something about the character models is just off and it's mostly their proportions. This is evidenced in the Story Mode, where characters like Spider-Man and Haggar are presented with massively muscular arms, but with tinier torsos that just don't match. Many of the character faces don't look quite right either, with vacant stares that get downright creepy. These characters are rendered slightly better during gameplay, but not by much. 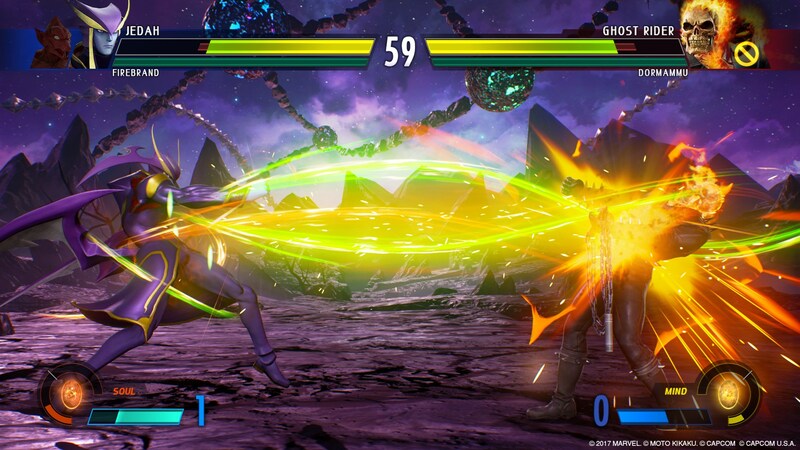 It gets to be distracting, which is a shame, because the game's stages and Infinity Stone effects look pretty good. In fact, these are some of my favorite stage designs in the series, offering cool backgrounds, gorgeous details, and neatly-animated background characters like M.O.D.O.K. While the single-player content feels phoned in, Infinite's multiplayer is enough to make it feel worthwhile. The Infinity Stone mechanic also helps it stand out, with enough variety to keep it from feeling like a tacked-on gimmick. It certainly has its shortcomings, but if Capcom can keep the roster growing, Infinite stands to have a good, long shelf life ahead of it. This review was based on a PS4 digital download provided by the publisher. Marvel vs. Capcom: Infinite releases on September 19 on PlayStation 4, Xbox One, and PC for $59.99. The game is rated T.